When I spotted these scalloped blue shorts I knew they were MADE for color-blocking. 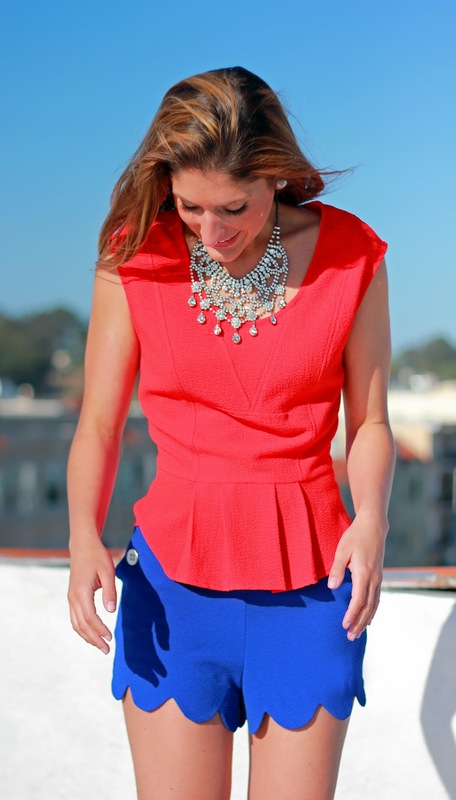 I'm absolutely obsessed with mixing blue and red, so this peplum top was an obvious choice. Such a great look. That necklace adds just the right amount of glam! I'm loving turquoise and yellow right now... actually, turquoise with anything! Love those shorts and the necklace!! Blue and red is such a powerful combo! I also really like your statement necklace! Wow, this is amazing! You really know how to style :) Love the necklace! That top is amazing. LOVE the deep red color & the fitting! Gorgeous combo with the shorts & pumps, so lovely! And that necklace is out of control, so gorgeous, I love it! You look stunning! What a beautiful color blocking! The shorts are of a great shade of blue and I love the necklace! Those shorts are amazing! My favorite color blocking combo is pink & yellow :) xo! I love when people color block with colors on the opposite side of the color wheel. So orange and blue, purple and yellow, etc. Yours looks great! Wow, this color blocking is perfect and I love the scalloped shorts on you especially> i'm definitely going to keep an eye out for those shorts! Amazing color blocking! Love the colors :) It reminds me off our Philippine flag! I love your scallop shorts! Oooh, such bold color blocking - I love it! I absolultey love those shorts! I am not quite bold enough to post pictures of myself on my blog yet but hopefully I am building to that. I have not yet tried color blocking as that is another bold fashion choice but I am LOVING the look! WOW! you couldn't be more prettier. i can't take my eyes off! the colours and the pieces are just perfect!!! congrats!! Fantastic colorful look! Love the scalloped shorts! I really, really want those shorts. Great color and awesome style! Wow you look great! The colors really work well together! Congrats! Because of your great fashion sense & blog! 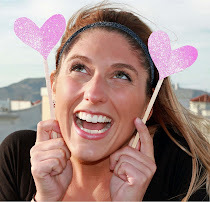 I am nominating you for the Liebster Award! For more details please see my newest post! Love your short very much! love the shorts!! cute outfit! sweet, chic and so summerish! love those shorts, wonderful color! I must find those shorts!